유전학을 수강하였던 학생이 어느 날 나에게 말하기를 그녀가 책(Genetics: A conceptual Approach)을 읽을 때면 나의 목소리를 듣는 것 같았다고 말한 적이 있다. 이 책에 대한 저자로서의 희망 사항은 유전학 공부를 위해 함께 여행을 할 때 나의 지식과 경험을 공유하자는 것이다. 이 책에서 나는 유전학을 가르친 27년 동안 준비하였던 자료들을 공유하고자 하였다. 나의 강점 중 하나는 유전학에 대한 지적인 지도, 즉 우리가 어디를 다녀왔으며, 앞으로 어디로 갈 것이고, 어떻게 그곳에 도달할 것인가를 보여주는 지도를 학생들이 만들어내는 것을 돕는 것이다. 학생들이 서툴러하는 곳에서 조언과 격려를 해주며, 주제가 관련되도록, 그리고 흥미를 갖도록 하기 위하여 사람, 장소 및 유전학 실험의 현재와 과거에 대하여 이야기를 들려주었다. 또한 필요한 세부적인 내용, 개념, 문제 해결력 기술들을 배우도록 돕고자 하며, 힘든 과정 후에 무엇보다도 소중한 성취의 맛을 알도록 격려할 것이다. 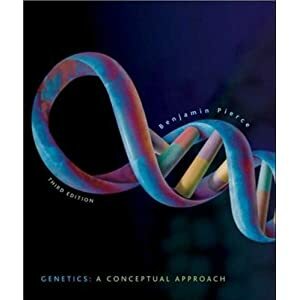 This book provides a wonderful and comprehensive introduction to genetics. I'm not a biology major, but I found that this book is both entertaining and informative. The author describes a wide panoramic view on the genetics, and yet addresses the fundamental concepts in genetics in very clear manner. DNA structure, replication, transcription to RNA, RNA processing, and RNA translation (a.k.a. the central dogma) have been very hard to comprehend and visualize, yet the author explains it very well. Numerous detailed illustrations in the book really helps to clarify the central dogma. All chapters start with VERY compelling REAL-WORLD cases that tantalizes you on learning the subject presented in the chapter. That makes me wanting to read for more. The writing is concise and clear. The author clearly knows his stuff. Overall, it is a great intro book. Great for both self-learners and in-class students. 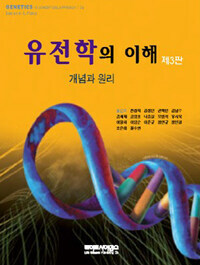 Definitely a must buy for those who want to get acquainted in genetics. For in depth contents: The book seems to be divided into four parts. 1. It starts with principles of classical (Mendelian) genetics with its applications on chapter 1. Then it goes into cell structures, functions, and reproduction with chapter 2-4. Followed by heredity principles of reproduction and how classical genetics fit into the analysis of hereditary traits. The next chapter discusses how classical genetics is not enough -- the author presents compelling cases like lethal alleles, incomplete penetration, and so forth in chapter 5-6. This limitation brings forth extensions and modifications on the basic principles, which is also discussed. The author also discusses other analyses to detect hereditary traits, such as pedigree analysis. 2. The second part is more toward modern genetics: How genes are not independently assorted as the Mendelian principles dictates. The concept of linkage, recombination, and consequently gene mapping are discussed in chapter 7. Followed by Chapter 8 is sort of intermezzo on bacterial and viral genetic systems. Chapter 9 discusses what chromosomes are and how chromosomes abnormalities occur and what type of abnormalities. Chapter 10 discusses about DNA and RNA structure, followed by chromosome structure in chapter 11. Chapter 12 discusses DNA replication and recombination with detailed illustrations. Chapter 13 discusses transcription process, followed by chapter 14 on RNA molecules and processing. Chapter 15 discusses about genetic code and translation, followed by chapter 16: Gene expression. Chapter 17 discusses gene mutations and DNA repair. 작년에 포렌식 심포지움에 참석해서 발표 순서를 기다리다가 먼저 발표하신 분의 유전자 감식에 대한 발표를 듣고 문득든 생각을 질문했다. “형제 자매는 부모로 부터 같은 유전자를 물려받는데 어떻게 다르죠?” 발표하신 분은 길게 이야기할 수 없어 그냥 “엄마가 애들마다 다른 것을 줘요” 정도로 답했는데, 이 책을 보면 왜 그런지 알 수 있습니다. 세포가 복제될때 체세포인 경우에는 세포핵 안의 염색체가 모두 복제되고 이후 둘로 나누어집니다. 복제의 정확도는 DNA서열의 염기 10억개(사람의 유전체에 해당하는 염기의 갯 수는 30억개) 중 하나 정도가 틀릴 가능성이 있습니다. 이러면 형제 자매 사이에 유전자가 다를 확률이 거의 없습니다만, 체세포가 아닌 생식세포(정자, 난자)는 좀 다릅니다. 생식세포는 감수분열을합니다. 사람의 경우 23종 46개의 염색체가 있습니다. 생식 세포가 분열할 때는 46개의 염색체가 23개씩 둘로 나누어 집니다. 그래서 감수분열이라는 이름이 붙었습니다. 이 감수분열시에 둘로 나누는 방법에 있어서 각각의 염색체 한쌍 중 어느 것이 어느 세포로 갈지는 임의적입니다. 따라서 각 염색체 마다 2가지의 경우의 수가 있으니 2^23=8,388,608 즉, 8백만 가지의 조합이 가능합니다. 이 것 뿐만 아니라 교차라는 것이 있습니다. 복사된 각각의 염색체 2개의 일부가 서로 염기서열을 교환하는 절차를 거칩니다. 교차하는 곳은 어디에서나 일어날 수 있으니 그 경우의 수는 계산하기도 어렵습니다. 또 교차가 한번이 아니고 2번이나 3번도 동시에 일어날 수 있습니다. 여기에 DNA내의 염기가 다른 것으로 바뀌는 돌연변이까지 감안하면 (일난성 쌍둥이가 아닌 이상) 형제 자매가 같은 유전자를 물려받을 확율은 없습니다.